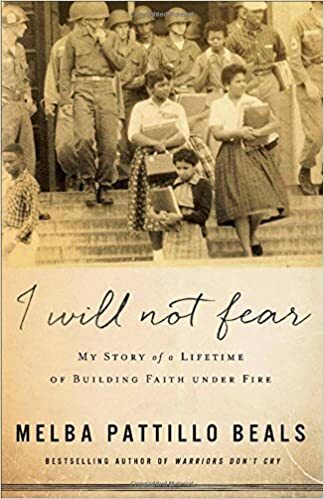 Melba Patillo Beals's book I will Not Fear should be regarded as an instant hit in the faith department. Even though she describes her early days of high school experience at Central High in Little Rock, Arkansas as tough, and a hard time to go through due to death threats and all she has overcome a great deal. She gives us an account of how her grandmother equipped her enough to deal with life's issues as a woman of faith. For me, I think Melba comes across as a bit of a Deborah type of woman. Even though Melba had to go through a lot in her life to get to the woman she is now shows not just a great deal of faith on her part, but also shows the strength and love Jesus Christ has given her to endure such terrible things such as hatred. At a time when the Ku Klux Klan was most at its height, during the 1950s, Melba endured life's harshness, I would say--with grace and poise. She gives us not only a glimpse of her life at Central High in Little Rock, but also those of her friends who integrated with her at Central High. I would say it's not an easy read due to certain things she talks about--hatred and the lengths some people go through who are hate-filled, but when it comes to faith-building you have to look at some of the harshness in life to see how much God overcomes on our part. If it wasn't for His love and grace, which He endured on the cross, no one could ever stand firm for the faith He so instills and gives to us. I find her story to be a rich tapestry of love, endurance, perseverance, faith and strength. I received a complimentary book from Revell for an honest and fair review.